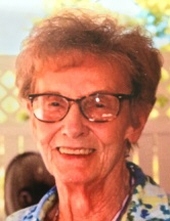 O'Connor, Doris Marie - Age 87, of Flushing, died January 27, 2019 at Maple Woods Manor in Clio, MI. Cremation has taken place. Mass will be held 11AM Friday, February 1 at our Lady Of Guadalupe Catholic Church, 2316 W. Coldwater Road, Flint. Doris was born August 15, 1931 in Bowlus, MN. She worked at AC Spark Plug for approximately 10 years. Doris was a wife, homemaker and a mother to 6 children. She lived in Mt. Morris and Flushing most of her life and was a member of Our Lady of Guadalupe Catholic Church. Doris enjoyed her rose garden, playing cards, occasional trips to the casino and was known for her cooking and baking. She also had her dog Cody which she enjoyed very much. Doris offered food to all who visited. She is survived by her children: Pat and husband Dan White, Danny and wife Debbie O'Connor, Laurie O'Connor, Brian and wife Tonya O'Connor. Terry and wife Kristi O'Connor, Ronny O'Connor; sister: Shirley Wohlrobe; brothers: Joseph Zimmerman, Jerome Zimmerman, Gerald and wife Colleen Zimmerman all of Minnesota; many grandchildren; great-grandchildren; nieces and nephews. She is preceded in death by her husband: Lloyd O'Connor; parents: Albert and Sophia (Kuchinski) Zimmerman; brothers: Bob, Don, John, and Jim Zimmerman; grandchildren: Rebecca, Tammy and Randy. Tributes may be shared on the obituaries page of www.sharpfuneralhomes.com. To send flowers or a remembrance gift to the family of Doris Marie O'Connor, please visit our Tribute Store. "Email Address" would like to share the life celebration of Doris Marie O'Connor. Click on the "link" to go to share a favorite memory or leave a condolence message for the family.